1st Gear: What Is Their Deal? There's a fantastic report out of Reuters today that captures the insanity of VW's obsession with the near-luxury Phaeton. Yes, it's a great car. Yes, we as Jalopnik writers are obsessed with them. No, it doesn't seem like a good idea to be working on a new generation of the car when you're tying to prop up profits while losing something like an estimated $32,000 per car for the first 10 years of production. Meanwhile, Michael Horn, VW's new U.S. boss is chasing a lofty sales target of 800,000 VW brand cars by 2018, more than double last year's tally. 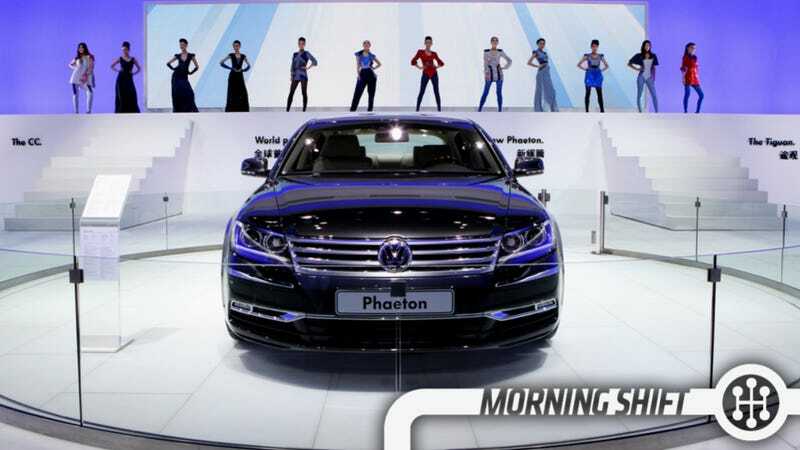 Horn will be tasked with relaunching the next Phaeton in the U.S. after VW pulled the model from the world's biggest premium-car market in 2006 because of poor sales. Horn struggled with the answer when asked by Reuters at the Detroit auto show what potential he sees for the model in the country. "That's a dangerous question," he said. "It's an image bearer with no relevance for volume." That's a dangerous question? Is Piech gonna have Michael Horn assassinated if he hints that it's weird to be making over-priced and over-engineered sedans to slot above under-priced and under-engineered Passats and Jettas? 2nd Gear: GMC To Build A Jeep Fighter? With Hummer long dead, there's been a hole in the market for tough off-roading vehicles that's only been party filled by the popular Ford Raptor. Gas prices are down. Truck demand is up. Personally, I'd like to see more Santa Cruz-style vehicles, but what if GM built a Wrangler? GM spokesman Brian Goebel declined to comment on the vehicle. However, he added that GMC’s U.S. Chief Duncan Aldred has been vocal on the need to capitalize on the brand’s growing momentum by expanding and strengthening its portfolio. “The idea is being kicked around real hard,” said one person briefed on the plan, noting that GM is looking at success of the Wrangler, some of which are fetching more than $50,000 new. Wranglers enjoy some of the highest resale values in the market. Here's a weird one. Mercedes does not sell the R-Class in the United States anymore, even though I always kind of liked it. They sadly don't make their big market decisions based on Matt Hardigree's tastes. Because almost all of Benz's SUV production is in Alabama and because the Chienese still love the R-Class, they've continued to build it for export in the United States. Because they need that line to expand new offerings like the GLE, Mercedes announced they'd be moving the R-Class to AM General in Indiana. Yep, that's right, the producer of the Humvee will be making Chinese market R-Class CUV/Wagons in Indiana for Mercedes. As Automotive News points out, AM General is a union shop, which adds a wrinkle to the UAW's efforts to get Ze Germans to warm to unionization in the United States. One of the seemingly effective strategies in the UAW's soon-to-expire four-year contract is the profit-sharing check workers get from GM, Ford and FCA. By tying some compensation to overall company performance it gives workers an incentive to help keep costs low and productivity up and, in the past, workers have walked off with up to $8,800. This year, according to The Detroit News, workers at Ford and GM will probably see smaller checks due to new F-150/Mustang and recalls, respectively. Chrysler, on the other hand, will probably be in a better position. Of course, the UAW is apparently pushing back against the idea that they should be held liable for recall-related profit hits. In December, Williams said the union was "in continued discussions about the profit sharing versus the recall." He did not provide details about the discussions. It's likely the union is arguing that the cost of the recalls — many of which are for older models — shouldn't take a bite out of members' profit-sharing checks. Sort of undermines the whole concept, right? Will cheap fuel undercut some of the big gains made by the Obama administration in cleaning up the environment? Cheap gasoline “adds an additional challenge to what is already an aggressive standard,” said Ed Cohen, vice president of government and industry relations for Honda Motor Co.’s North American unit. The same can be said for renewable fuels. The Bloomberg Global Large Solar Index of 21 companies that sell solar-energy products — which are now competing against falling electricity rates — has sunk 39 percent in the 12 months through Jan. 27. The Environmental Protection Agency’s plan to cut carbon emissions from power plants by pushing the companies to embrace renewable and other clean energy sources would now be a more expensive undertaking relative to using traditional fossil fuels, said Philip Wallach, a fellow at the Brookings Institution in Washington. In fact, the Energy Information Administration has already begun backtracking on predictions that U.S. carbon emissions would fall this year and next, saying Jan. 13 that it now expects to see an increase in the pollutants, citing a drop in prices that will spur greater use. Hey, it's good for the economy. The space shuttle Challenger explodes just after liftoff on this day in 1986, killing the seven astronauts aboard. The Challenger was the second shuttle built by the National Aeronautics and Space Administration (NASA). It took its first flight into space on April 4, 1983, and made a total of nine voyages prior to January 1986. The 10th trip for Challenger included a teacher from New Hampshire, Christa MacAuliffe, among the astronauts, as part of a new Teacher in Space project.